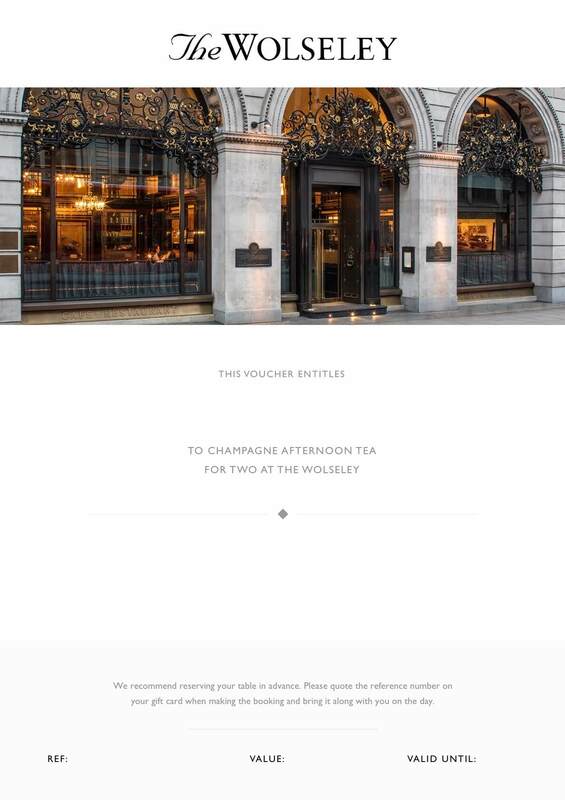 For a memorable and celebratory occasion, give the experience of Champagne Afternoon Tea at The Wolseley for two. Your recipient plus guest can enjoy Champagne Afternoon Tea Monday-Friday 3pm – 6.30pm, Saturday 3.30pm – 5.30pm or Sunday 3.30pm – 6.30pm. Our Champagne Afternoon Tea menu includes Assorted Finger Sandwiches, Fruit Scones, Pastries, a Choice of Teas and a glass of Pommery Brut Royal NV each. Alternatively, the E-Voucher can be redeemed during any other service (to equivalent value of £40 each or combined value of £80).